When the time came to choose the car I would be driving around Germany during our Speedhunting trip to Munich I immediately went for the more powerful M5. I knew I had chosen the best car, 500 HP and a pair of paddles to machine-gun through the 7-gears of the DSG gearbox. 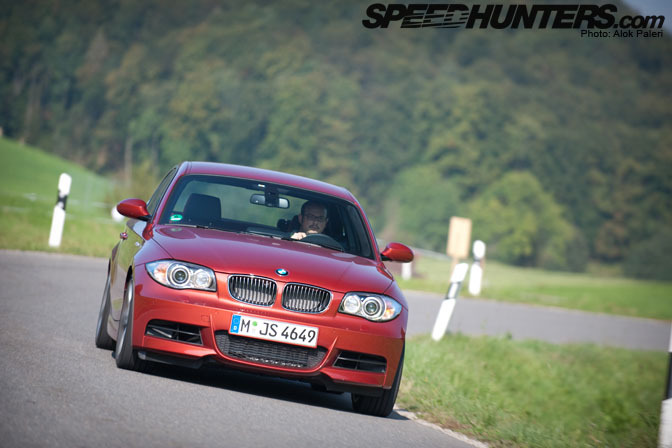 But Rod had a smug look on his face after our first stint in our cars across a bit of Autobahn and country roads. It wasn’t until the following day that I had a chance to understand why. You see, dropping a 306 HP twin-turbo, straight-six engine into a rear-wheel-drive 1-series coupe is probably the best idea BMW has had in the last decade. 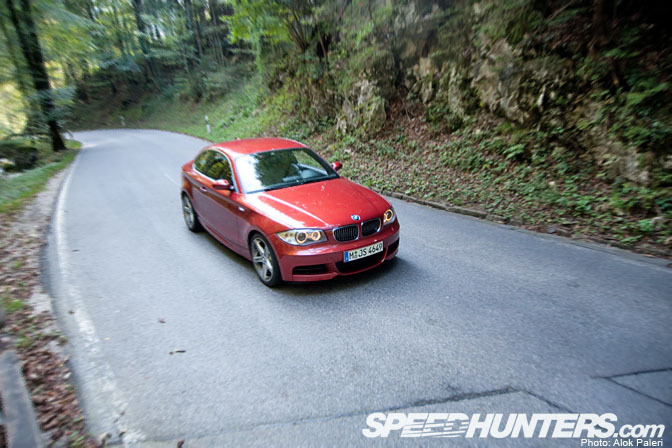 Sampling the 135i through Munich I was immediately impressed. It felt so tight, so maneuverable and so immediate in its response, I was hooked. Those 295 lb/ft of torque developed in a plateau from 1,300 rpm to 5,000 rpm make the little “1” lethal, giving it towering acceleration no matter what gear you are in. …which is a good thing, as that is exactly where we headed for some driving shots. The 135i really does come alive when pushed hard, the front end digging in precisely on corner entry and the rear squatting down as you get back on the power. The gearbox was extremely crisp in its engagement, with a precise and short throw making it a pleasure to use. The engine revs effortlessly all the way to the 7,000 rpm redline, giving a very un-turbo-like linear power delivery, accompanied by a very typical six-cylinder soundtrack. The only thing that really disappointed me was the lack of a limited slip differential, making the 1-series smoke the inside rear tire every time I came out of tight hairpin-bends, the same corners the M5 threw its tail out with the smallest prod of the throttle. …and very organized in the interior. The seats were very supportive and like in the M5 all the commands were just where you would want them to be. 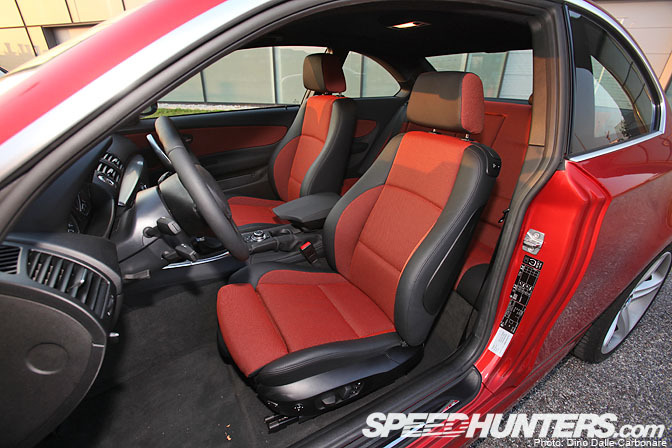 There is a good amount of space for rear seat passengers too. 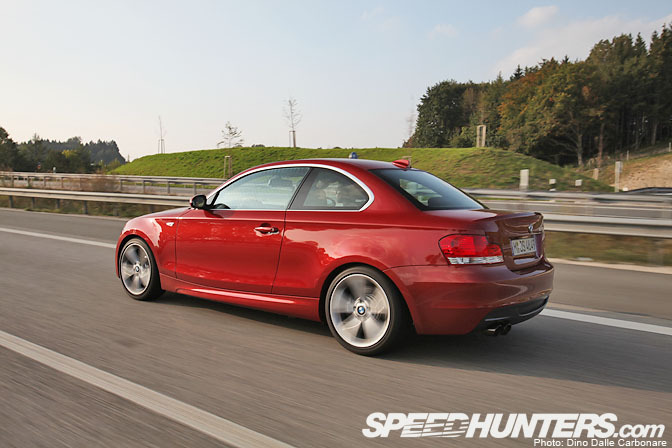 With the driving pictures done, Rod took the M5 and we headed back towards Munich. He lasted about 10 minutes, stopping at a gas station and demanding I give the 135i back! LOL! He wasn’t getting along with the computerized 5-series and its temperamental gearbox. 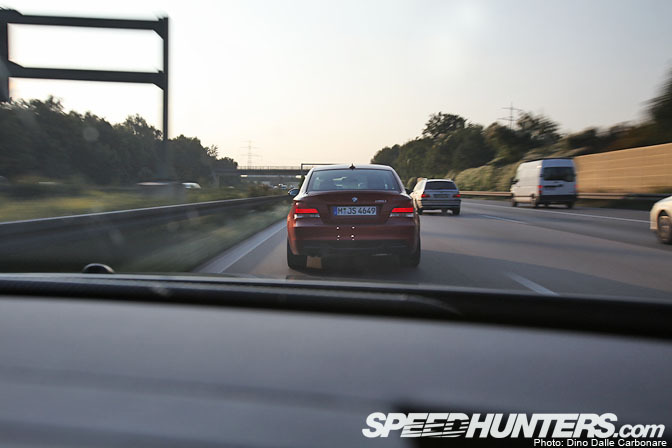 …especially when he could edge closer and closer to that 250 km/h speed limiter. I have to admit, the M5 was struggling to keep up, every time Rod stepped on the accelerator it seemed the immediate torque of the force-fed engine had the upper hand over the NA V10…for a few seconds at least! …but we had time to grab a few more shots. 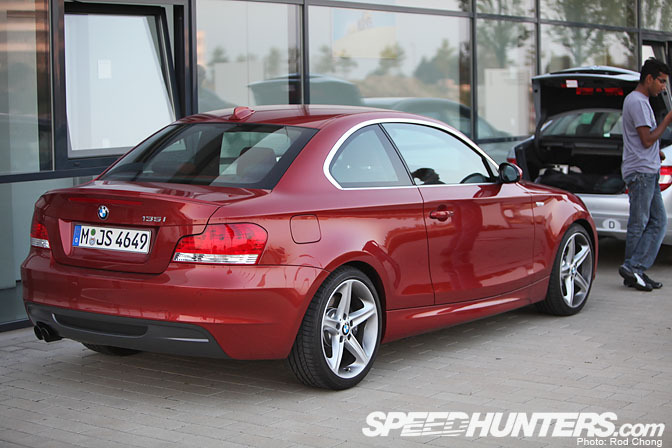 This is my favorite angle of the 1-series coupe, I can’t help think of it slammed onto some nice Japanese wheels! 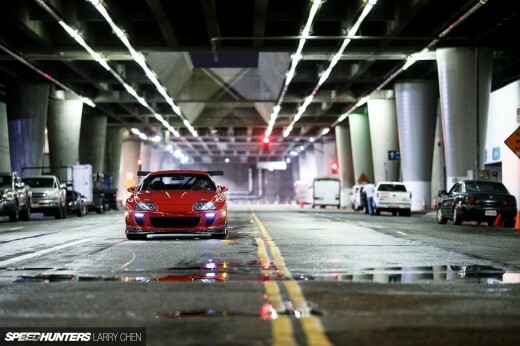 These two cars represent two very different approaches to performance. Two distinct characters that I enjoyed getting to know and appreciate. The M5 shined for its supercar capabilities wrapped up in a luxurious and comfortable package, while the 135i was the more rewarding to drive, satisfying the driver on all levels. 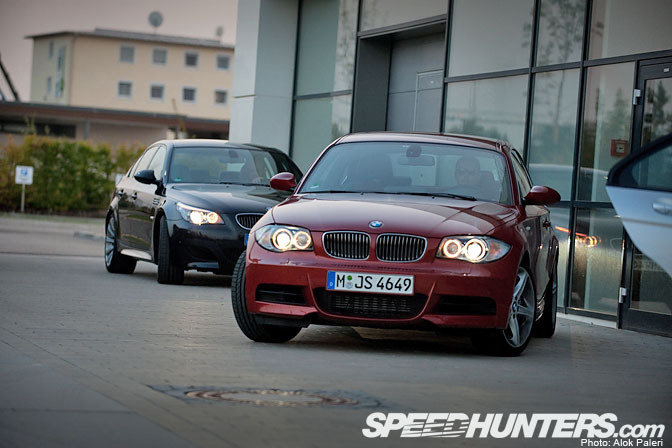 It would be hard to choose one, but if I really had to I would have to go with the lighter and more involving 1-series. The potential a little bit of engine tuning could unleash makes it even more appealing, not to mention how much better it would be with a nice and tight LSD. White lowered on a set of bronze Volk Ce28n's, perfection.